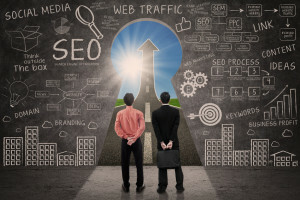 Of all the digital marketing strategies out there today, search engine optimization (SEO) is one of the hottest — and not to mention the most effective. The predominance of the Internet in modern times has turned the search engine into the most frequented online resource on Earth. Search engines such as Google, Bing, and Yahoo process billions of search requests every day and the companies themselves are growing at an exponential rate. As a result, businesses across the globe have been using search engines to get their piece of the trillion-dollar online sales industry. Marketing via search engines can reach literally billions of people at a time — something that was simply impossible before the advent of the Internet. What is search engine optimization? SEO is the process of creating website content that attracts the web crawlers search engines use to get content. Search engines use incredibly complex algorithms in their web crawler programs. The job of a SEO strategy is to figure out these algorithms and design websites accordingly. That way, webpages will appear first or close to it, which drives traffic and ultimately increases the customer base. Use Simple, Concise Language: As much as it’s tempting to sound “sophisticated,” it’s important to use common rather than rare or niche words for web content. “Keywords” are one of the most important aspects of SEO content; the better targeted the keywords are, the more effective the content will be. As such, using unnecessary jargon and euphemisms isn’t the way to go. Writing “processing units” when referring to “computers,” for example, can lead users and crawlers elsewhere, even if the content itself is relevant to computers. Don’t Duplicate Pages: Duplicating pages is somewhat common in web design but it should be avoided at all costs. Duplicate pages can confuse web crawlers, which only go after original (or “organic”) content. Coding, Coding, Coding: Advanced, up-to-date coding can make or break a SEO campaign. Incorrect directives (example: robots.txt) or link structures can disrupt a web crawler. Even indexed pages can suffer if the coding isn’t there. It’s also good for a web development team to keep in mind that visual format coding is much more popular now than traditional text content. For more information about search engine optimization, feel free to leave a comment or question at the bottom.